Le Cordon Bleu Japan offers a fully-funded culinary programme for foreign residents interested in learning the basics of Japanese Cuisine, in Japan! Learn the basics of the Japanese language, culinary techniques from master chefs, and apply them both in a 6-month internship at a Japanese cuisine restaurant. 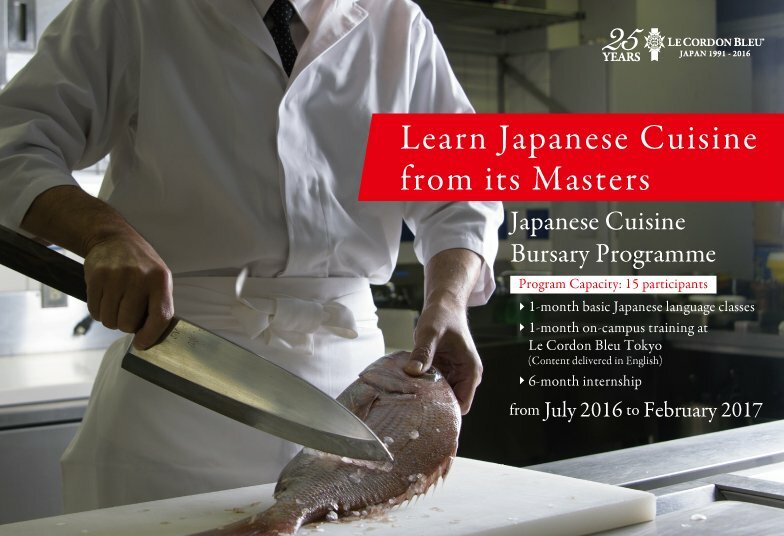 The programme spans from July 2016 to February 2017, as a special bursary program, developed under a project initiated by the Organization for Fostering Human Resources for the Promotion of Japanese Cuisine & Food Culture, targeted for culinary school graduates or industry professionals looking to broaden their culinary horizons. *Announcement of selected candidates to be made on June 3. *Participants must remain in Japan during this period. *Participants will be financially responsible for meals, domestic transportation within Japan, kitchen shoes and any other private expenses. If you are successfully selected as a participant, these documents will be used for the visa application process, insurance registration (health insurance and liability insurance), as well as registration for each training programme during the 8-month programme. If you are successfully selected as a participant, you will be sent the Terms and Conditions, which should be read, signed, and sent to infojapan@cordonbleu.edu before June 3. Your admission to the programme will defer to the next candidate on the waiting list should you fail to submit this before the deadline.